New review: Genesis Day One singlespeed road bikes. Genesis Day One is a single speed commuter bike model. Day One is ideal for those looking for an alternative to hybrid bikes. This model is perfect for everyday needs, like travelling to and from work. It offers solid and reliable navigation. Though the bike model can be a bit expensive, it’s worth trying out. Genesis Day One made a splash in the UK as a alternative to so-called hybrid commuter bikes. It costs an arm and a leg, so we were especially enthusiastic to find out of the actual product justified the price tag. We have to say that the overall design of the Day One is quite eye catching. The blue-gray coat gives a unique looks that stands out from the usually black or red bikes out there. Of course, looks aren’t everything. Let’s look at everything else our reviewers loved about this bike. It’s surprisingly lightweight. The Day One averages weights at 10 kg. Combined with the steel frame, which clangs when you tap the top tube, this model offers a very comfortable ride. The bikes come with 35mm Continental tires. These are intimidatingly wide, but rolls very fast ensuring good speeds throughout. The breaks of this model are cable operated, so they are not as powerful as the hydraulic ones seen on other models like Cube. On the flip side, the cables ensure that wheel rims last longer. Day One can easily gather speed and navigate nimbly through traffic without a problem. Yes, it has single speed gears, but that’s not a problem. Single speed bikes like Day One offers a simplicity that other bikes nowadays really don’t. 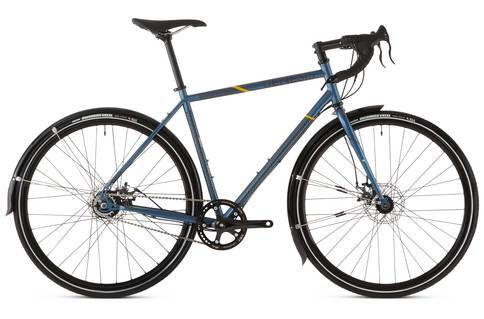 Genesis Day One is a really good looking and reliable commuter bike that anyone can have. Even if it’s single speed, it comes with fast rolling tires to ensure speed. The design is secure and easy to handle through traffic. Genesis Day One is highly reliable bike that newbies will love. Pros will certainly love the comfort and simplistic design this model offers.